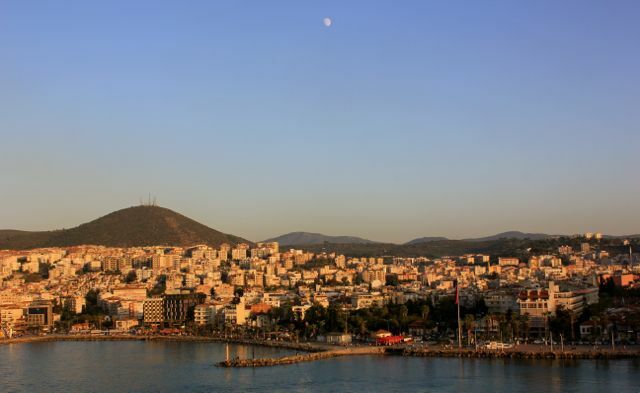 On Day 4 of our cruise after Croatia, and before our stop in Greece, we stopped in the port of Kusadasi. 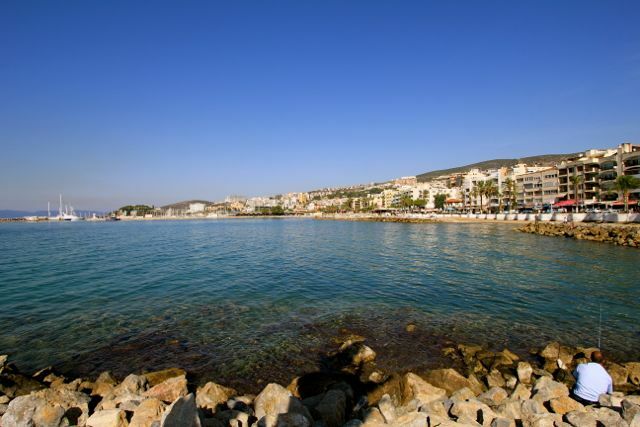 Located to the east of Greece along the eastern Mediterranean Sea is the port city of Kusadasi, Turkey. 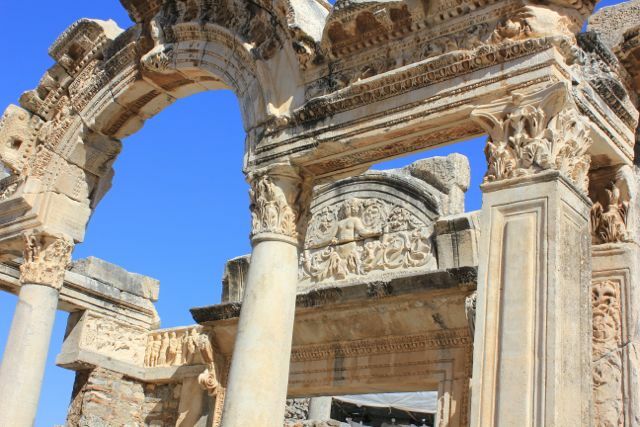 It is basically a beach resort area, but it is better known as the launching point to the ancient city of Ephesus. To be completely honest, other than Istanbul, I had no real expectations of what Turkey would be like. Kusadasi is a lively place. The port is in a semi-circular harbour where the Mediterranean lazily laps on a rocky shoreline. Small shops and restaurants lined a walking path around the harbour from the cruise ship. 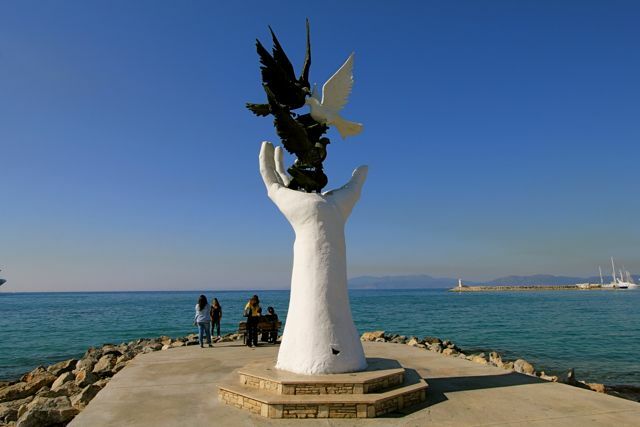 At the center, was a statue of a hand holding a dove, and is called the peace monument. 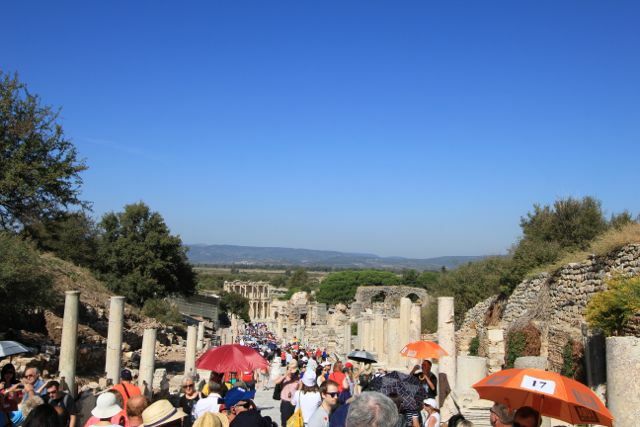 We boarded our bus that was to take us to our destination, the ancient city of Ephesus about 45 minutes away. Our tour guide was very helpful in explaining the region and the history. 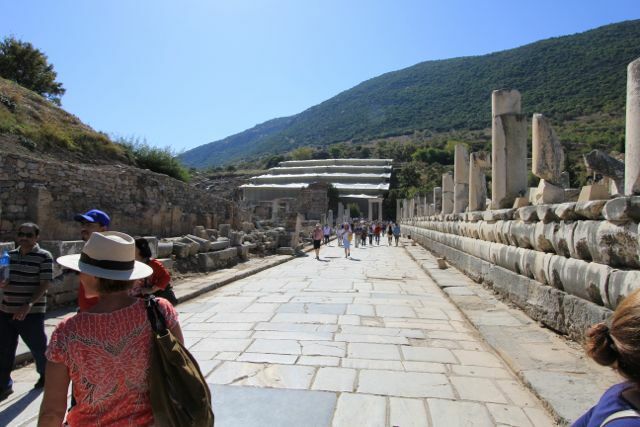 We arrived at the upper entrance to Ephesus. 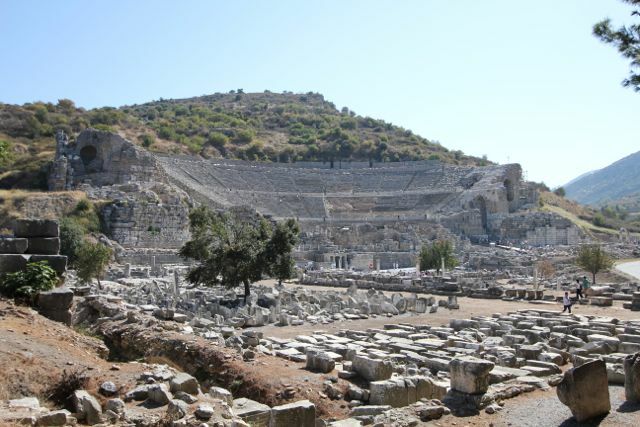 The amazing thing is that 3,000 years ago, Ephesus was a seaside city. Now, the sea is some 30 miles away to the west….CRAZY! 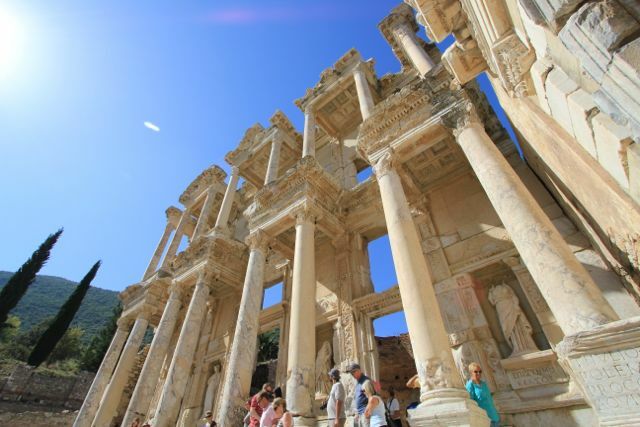 Ephesus is an ancient city. As the sea retreated, people began leaving the city. As they built new buildings, they took stone work away from here. Between this, damage from earthquakes, theft, and time….the remains of the city are seen here. Imagine 3,000 years ago and this is a city street. With the hundreds of people here today, this photo helps with that mental image. Back in the day, this street was traveled by horse and chariots. Cleopatra & Mark Antony, Romans, Greeks, Turks, and countless others have been and have ruled this city. Also, the legend is that the Virgin Mary came to Ephesus to live prior to her death. 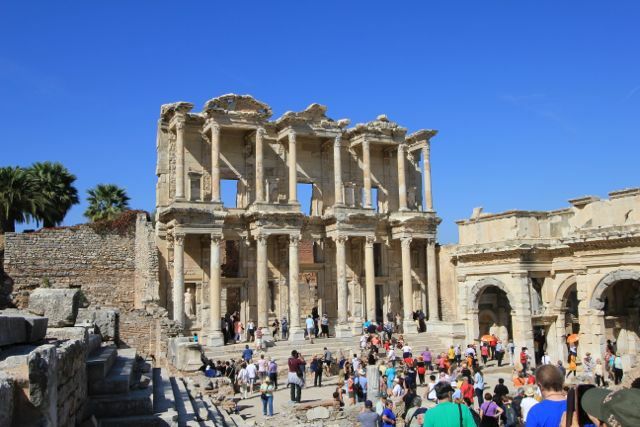 The large structure is the Library of Celsus, built in about 115 A.D. At one time, it housed up to 12,000 scrolls (documents). Inside the remains of the large arena that use to seat 24,000 people. And, no, this was not to watch a Rolling Stones concert (even though they probably were alive back then). 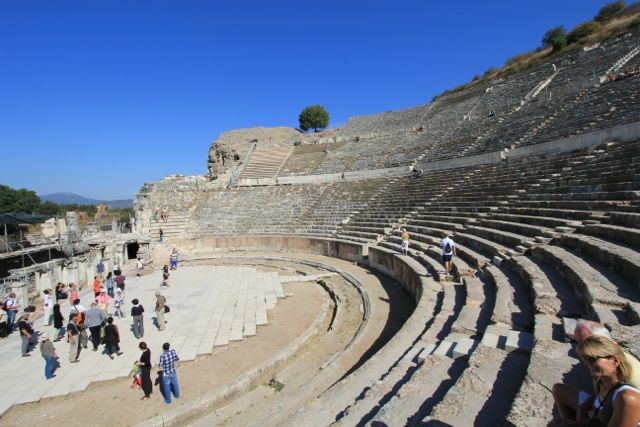 This arena is thought to be the largest outdoor theater an ancient times. 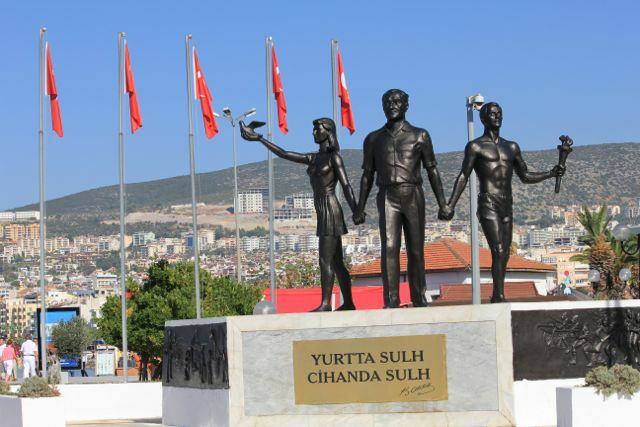 The country of Turkey has an unique distinction geographically. It is both in Europe & Asia. The part we visited is in Asia, so technically we visited a 2nd continent on our trip. Turkey is a beautiful country. One that we will return to on future Mediterranean cruises.